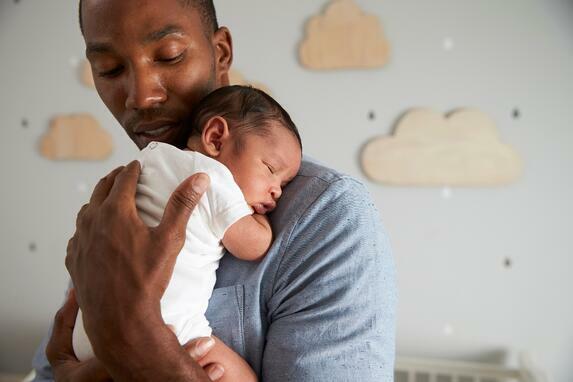 How much do you know about the characteristics of first-time dads? What’s their average age? How does their age vary by race and ethnicity? How much does it vary by education? Before you read further, take this short quiz to see how much you know about first-time dads. Write down your answers. You can find the correct answers at the end of this post. What is the average age for first-time dads? a. The average age of first-time dads has risen steadily, while the average age for first-time moms has fallen recently. b. The average age of first-time dads has fallen recently, while the average age for first-time moms has risen steadily. c. The average age of first-time dads and first-time moms has risen steadily. Compared to men who are married when they become first-time dads, how much younger (rounded to the nearest whole number) are men who are single when they become first-time dads? Compared to men who have at least a bachelor’s degree when they become first-time dads, how much younger (rounded to the nearest whole number) are men who never graduated high school when they become first-time dads? I asked you to take that quiz to focus your attention on the “Golden Moment” to engage dads—the time before and immediately after a child’s birth. Dads and moms, including those in fragile families, are most highly motivated for the dad to be involved in the lives of their children during the prenatal and immediate postnatal period. Countering resistance to dad’s involvement—whether on the part of dad or mom—is like pushing a boulder up a hill. In some cases, it can be impossible to overcome. In other cases, it can be overcome, but not without a lot of work and help from others to reach the other side of the hill. Resistance is lowest during the Golden Moment. In some cases, it’s nonexistent because couples open their hearts as they anticipate and welcome their newborn. That’s why the use of tactics to reach dads during this time—such as through OB/GYNs, pediatricians, hospitals, birthing and pregnancy centers, and home visiting programs for new parents—prove so effective in the short- and long-term. Indeed, the long-term impact expands our understanding of why this moment is golden. When you connect a dad during this time, you increase the chance he’ll stay involved for the long haul. So You’re a New Father (or are About to Become One) (Brochure): Ideal for dads during the prenatal and postnatal periods. A Checklist for Keeping Your Child Safe from Newborn to Toddler (Brochure): Walks dads through actions they can take to keep their child safe from dangers and potential dangers around the home. The Importance of an Involved Father (Brochure): Shows dads exactly why they’re irreplaceable in the life of their child. Pocket Guide for New Dads (Pocket Guide): A more in-depth print material than NFI’s brochures or tip cards. With the exception of 10 Tips for Expectant Dads, each of these tools is available in English and Spanish. If you or your organization has the capacity to do in-depth work with expectant and new dads, NFI’s 24/7 Dad® programs and The 7 Habits of a 24/7 Dad™ workshop are excellent choices. What tactics do you use to reach expectant and new dads? Are you aware of all NFI offers for expectant and new dads?